Show duration: Saturday, May 21, 2015. 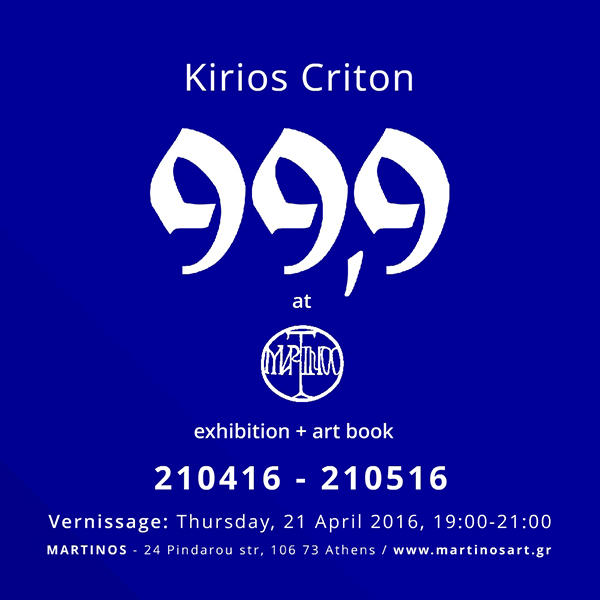 MARTINOS is happy to present an exhibition titled 99.9 and a book by Kirios Criton. Through the ironic title, the artist opposes the absolute commercialization of our times, the 0.99 cliché, while stating the year of his last exhibition that took place in 1999. The decimal number 99.9 manifests itself throughout the show referring to quantity, size, prices, as well as the subtle symbolism of the objects. The exhibition captures the artist’s desire to convey his ‘filosofia’ to the audience. The installations and the ceramic objects especially designed by Kirios Criton for this show, conceal messages, symbolisms, challenges and feelings. Along the exhibition, and in a humorous disposition, Martinos presents the “Greek teasers” ‘teased’ by Kirios Criton. Objects from the Martinos collection combined with modern artwork and design items are selected and presented as small art sets individually themed and titled. Kirios Criton was born and raised in Piraeus. He lives and works in Thession. He has designed the interior and the exterior of houses, shops and restaurants. Some of his most characteristic works are the restaurant “Aristera Dexia” in Rouf, the gallery “Never on Sunday” in Thession, the “Bunker” in Athens Metropolis and many more. As a design and interior decoration specialist he has collaborated with various magazines. He has participated in many international art and design exhibitions such as S.A.D. and F.I.A.C. in Paris. His work can be found in private collections.